According to the Bureau of Labor Statistics, the Healthcare industry is expected to grow 19 percent from 2014 to 2024, providing 2.3 million jobs to the economy. This is more growth than any other group of occupations. In May 2015, the median annual wage for healthcare practioners and technical occupations was $62,610, higher than the overall annual median wage for all occupations at $36,200. The large amount of growth in this industry has to do with an aging population, while also taking into account the federal health insurance reform that will increase the number of individuals who have access to health insurance. Projected to grow 17 percent from 2014 to 2024, Medical and Health Services Managers help plan, direct and coordinate an organizations medical and health service needs. This occupation accounted for approximately 333,000 jobs in the healthcare industry in 2014, according to the Bureau of Labor Statistics. In May 2015, the median annual wage for medical and health services managers was $94,500. As a whole, the healthcare industry has a very favorable outlook in the coming decade. Due to an increase in demand, there will be a greater need for healthcare workers, in all areas. As medical technologies begin to grow, the demand in management in these areas will also grow, as organizations become more complex. Medical Assistant: Medical offices that appear to you to run like well-oiled machines often accomplish that with the important help of medical assistants. These individuals perform various tasks depending on the occupational setting, although most work in physicians' offices. 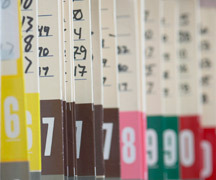 Tasks include work related to health information.